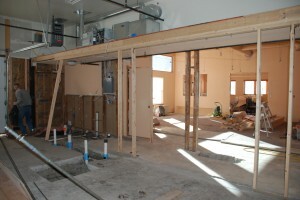 Renovations of the new Literacy Outreach interior passed their first inspection with the City of Glenwood Springs. On Friday, January 18 we passed our first building inspection with the City of Glenwood Springs! Thanks Maria Claire Jacobi for engineering the project and Dan Becker for doing all of the “dirty work.” Literacy Outreach is relocating in late March to 1127 School Street in downtown Glenwood Springs. For the first time in our 26 year history, Literacy Outreach staff will enjoy windows and sunbeams in our office! Carolyn Prinster in memory of her late husband, Leo t. “Teo” Prinster, has donated all of the funds to renovate the new building. The Teo Prinster Learning Center will be opening soon. The donor of the building wishes to remain anonymous. Watch for our grand opening in April.